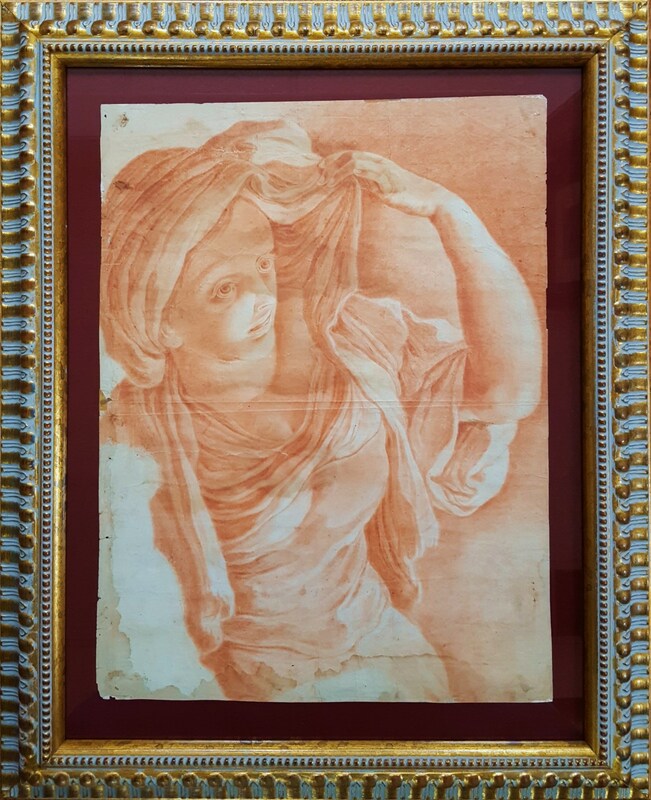 Title: "Giovane Donna Guardando a Sinistra (Young Woman Looking Left)"
Framed size: 27.5" x 22.25"
Sheet size: 20" x 14.75"
Giambattista Pittoni or Giovanni Battista Pittoni (6 June 1687 – 6 November 1767) was an Italian painter of the late Baroque or Rococo period. He was among the founders of the Academy of Fine Arts of Venice, of which in 1758 he became the second president, succeeding Tiepolo. Pittoni was born in Venice on 6 June 1687. He studied under his uncle Francesco Pittoni, a well-known but undistinguished painter of the Venetian Baroque; a Samson and Delilah at the Villa Querini in Visinale, near Pasiano di Pordenone, is signed by both painters. The theory of Rodolfo Pallucchini (it) that Pittoni studied under Antonio Balestra is now generally discounted. Pittoni was unwilling to leave Venice and travelled little although he received many foreign commissions, no journey in connection with any of them is documented, while from 1720 onwards records show that he was in Venice in every year. However, in 1720 he may have travelled to France with his uncle Francesco, together with Rosalba Carriera, Antonio Pellegrini and Anton Maria Zanetti. His change of style from a heavy Baroque to a lighter and more delicate Rococo manner dates from about this time; some older writers have attributed this change to an indirect French influence, perhaps through Pellegrini or through Sebastiano Ricci. Pittoni joined the Fraglia dei Pittori Veneziani, the Venetian guild of painters, in 1716. From, probably, the same year until his death he was a member of the Collegio dei Pittori, of which he became prior in 1729. He was elected to the Accademia Clementina of Bologna in 1727. In 1750 he was one of the forty-six founding members of the Veneta Pubblica Accademia di Pittura, Scultura e Architettura, which later became the Accademia di Belle Arti di Venezia; from 1758 to 1760 he succeeded Tiepolo as president of the academy, and was elected for a second term in 1763–64. Pittoni died in Venice on 6 November 1767. His tomb is in the church of San Giacomo dell'Orio, Venice.